Or at least, that's how the saying goes, anyway. I feel a little foolish preaching patience after the stinker we all witnessed on Monday night, but I am holding the line on that position. 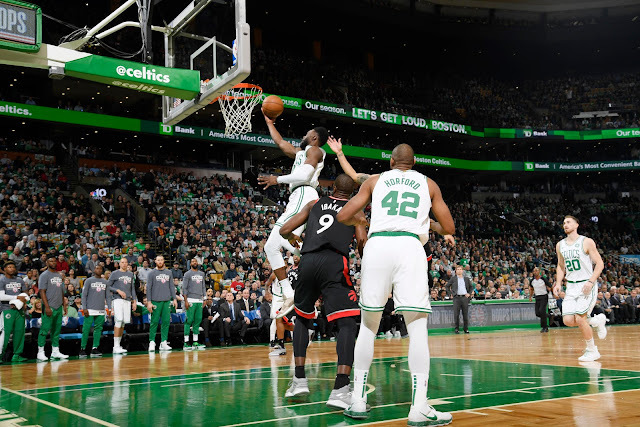 You see, as much as I'd like to pin all of this on Terry Rozier's desire for a bigger role, Jaylen Brown's disturbingly recurrent Marcus Smart impressions from beyond the arc, Gordon Hayward clearly not being right yet, or Al Horford looking tired on a lot of nights, it's none of these guys' fault the Boston Celtics have come out the gate so...flat. It's all of their fault, collectively, and the problem, ironically enough, likely stems from having too many guys used to carrying heavy loads, and not enough adapted to shifting expectations in the usage department. Worse, a lot of them are rhythm guys, young, or both, so confidence is important. However, I'm not here to talk about blame, or even lineup tweaks; the patience I am preaching for is of an entirely different reason. A lot of you are very (rightfully) unhappy, and want to see players moved. While I won't say I agree (yet) that we should be making drastic moves, I will say you'd have to be living in a cave not to see the impetus behind such sentiments, sentiments that may indeed prove to be right...just not yet. Why, you ask? Well, apart from the schedule moving into its easiest segment of the season that I've wrote on recently (with Kemba Walker cooking up some egg just for my face yesterday), there's practical reasons to consider waiting, too. Mainly, right now, the only players we'd likely be able to land without significantly lowering the ceiling of this team this season and beyond are players on teams with very big problems, and its fair to say that at least some of those problems are their fault specifically (cough cough JR Smith), or hardly an upgrade when you consider the same issues players you already have (streaky, high-usage, checks out at times) exist in players you'd be trading for (like, say, Bradley Beal) you'd have to offer up quite a few assets to land. I'm not saying those players are a lock to fail in green and white, but I am saying they aren't the missing piece to success, never mind contention, and are at least as likely to be a lateral move or step back as forward. So everyone says the Hornets need to trade Kemba and they’re 8-8. The Celtics are 9-8, so…. who’s going to get Aron Baynes some help? There's also the possibility of exactly the player(s) we'd want to consider dealing for suddenly becoming available; with tensions high in Golden State with the Warriors losing five of their last ten games, the Houston Rockets a lottery team if the season ended today, and the Utah Jazz looking unlikely to make the postseason at all, quite a lot of interesting things could happen between now and February. Including this team starting to play like we expected them to. Perhaps even more important, there's a very big reason to be patient - literally built-in to the collective bargaining agreement. Players signed over the summer cannot be dealt until December 15th, or three months after their signing, whichever is later, so dozens of guys around the league will become available to be included in deals on that date. For Boston, that means if they want to include Aron Baynes, Jabari Bird*, and/or Brad Wanamaker in a one-for-one, aggregated, or into-cap-space deal, they could provide up to $7.3 million in contracts, more if we waited for Smart to become available mid-January. But let's just focus on the December 15 date for now. Besides our own flexibility, a one Kevin Durant would be eligible for a trade on that date, with the caveat he'd have to approve given he's on a one-year deal with Bird Rights in play; his teammate DeMarcus Cousins, if healed, could also be dealt on that date, and on a very low salary, too. As unrealistic as those scenarios may be, even with the recent rumblings from the Bay area, a number of more realistic options could also become targets - DeAndre Jordan, Zach Lavine, Tyreke Evans, JJ Redick, and Jusuf Nurkic all join the ranks of the trade-eligible on the fifteenth of next month, and while unlikely to be moved, other teams, like the San Antonio Spurs, might be able to be convinced to part ways with Rudy Gay, or the Los Angeles Lakers Rajon Rondo. I don't think those are the moves to make, however, as all with the obvious exception of Durant bring as many issues as they solve, directing my attention to guys who would likely be comfortable in lower-usage roles while also filling needs Boston seems to lack, namely creating offense and distributing the ball. For backup floor generalship, there's some excellent options who might reasonably be had come mid-December, like Tony Parker or Elfrid Payton, should the Charlotte Hornets continue to look like a lottery team despite Kemba Walker's heroics, or if the New Orleans Pelicans continue to thrive without Payton while he mends his broken hand. For scoring, especially from deep, there's a host of options to consider - far too many to list. Some of my personal favorites I think we might have a shot at are the Sacramento Kings' Nemanja Bjelica (.492 from deep on 3.6 attempts per game), the Miami Heat's Wayne Ellington (.413 from three on seven [!!!] attempts per game), the Minnesota Timberwolves' Anthony Tolliver, Cleveland Cavaliers' Rodney Hood, Brooklyn Nets' Shabazz Napier, Memphis Grizzlies' Shelvin Mack, and Chicago Bulls' Antonio Blakeney. Those are all players on cheap and often short deals looking to establish or rehabilitate their value, but not with expectations of coming into a team like Boston and starting - in other words, quite possibly what we're looking for if and when we decide to make a deal. While I still believe in this team, it's good to know there will be plenty of direction the team can turn if things are still putrescent 25 days from now.